Last Monday Dave and I had our engagement session with our wedding photographer. Robin of Robin Fox Photography is going to be our photographer, and I could not be happier with our choice. Having your engagement photos taken can be weird. You and your fiancé are all up in each other’s business, and this person who you probably have never met before is snapping your picture. But there are ways to make your photo sessions more successful. And trust me, having had my one hour session makes me something of an expert. Coordinate is the key word here. Not match. I love photos where couples tie their clothing in together with some form of accessory. If you look at our photos, Dave is wearing a blue shirt, so I tied that in to my outfit with a blue necklace. You can definitely wear some deep colors (jewel tones look beautiful in photos), but we chose to keep it neutral, since one of our locations was going to have some bright flowers. There are seriously a ton of recommendations on Pinterest about what you should wear to an engagement shoot. If you ever are wondering, just take a browse for a hot second. Going along with the clothing, make sure that all of your clothes fit, are clean and ironed ahead of time. I purchased my dress from the Gap about 2 weeks before our shoot, and I lost a few pounds in that time. You can tell around my waist that it is starting to get a little big. On the other side of that though, the last thing you want is to have clothes that are too tight, or you feel uncomfortable in. Any uncomfortableness shows right through on camera. Have fun with your accessories. Dave is wearing a belt with crabs on it, because it is a fun little nod to our time living in Virginia. I’m wearing a fun braided necklace. Make sure your engagement ring is clean and sparkly. Don’t go too overboard though—the last thing you want is for your accessories to overpower you! Your photographer should be able to help you with this, but the location of your photos is so important! We chose to have our photos at landmarks in the city where we both grew up. This was meaningful to both of us. When you think about locations, think about things that you like to do. Places like farmers markets and coffee shops make great locations, and so do beaches and sports arenas! Also think about meaning. Where did he propose? Where did you first say “I love you”? Where did you first kiss? These all would make great, meaningful locations for photos. Some of the best photos I’ve seen are of couples interacting in an activity. Maybe it is playing a game together, or cooking, or shopping at an antique store. Macy has amazing photos of her and her fiancé playing at an arcade. These photos always look so candid and happy – exactly what you want! Props can be tough sometimes. The key to good props is simplicity. Make sure your prop is significant to your relationship in some way! We are serious coffee lovers, so I was thinking about bringing some mugs or Starbucks cups. I forgot them at the last minute, but I kind of wish I had!! 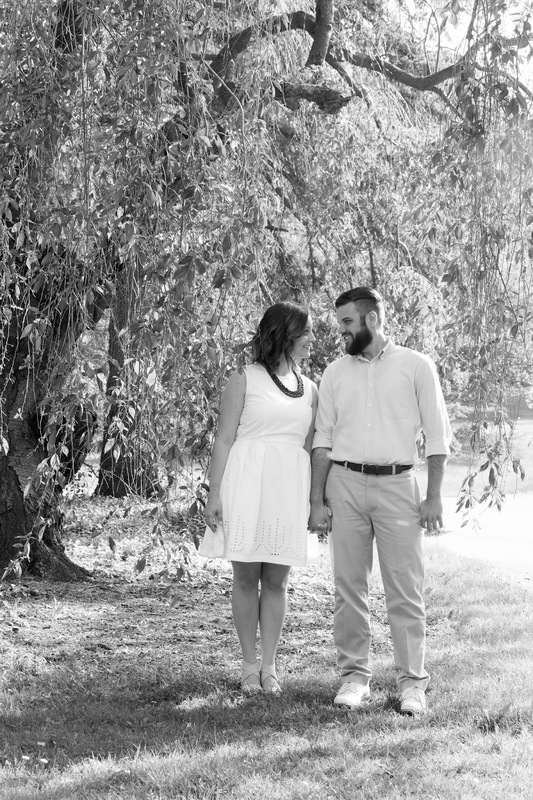 This photo shoot is all about how much you and your fiancé love each other! I was a little nervous at first (and so was Dave), but once we started, and Robin was helping us to pose and relax, everything was easy. We were joking around with each other and talking about what kind of food we were going to get when we were done. If you go into your photos overthinking everything, you are not going to have a nice, fun experience (and you are probably going to have one of those “am I thinking too hard, or do I just need to use the bathroom” faces, and who wants that in photos that you probably paid a lot of money for. RELAX and enjoy it! 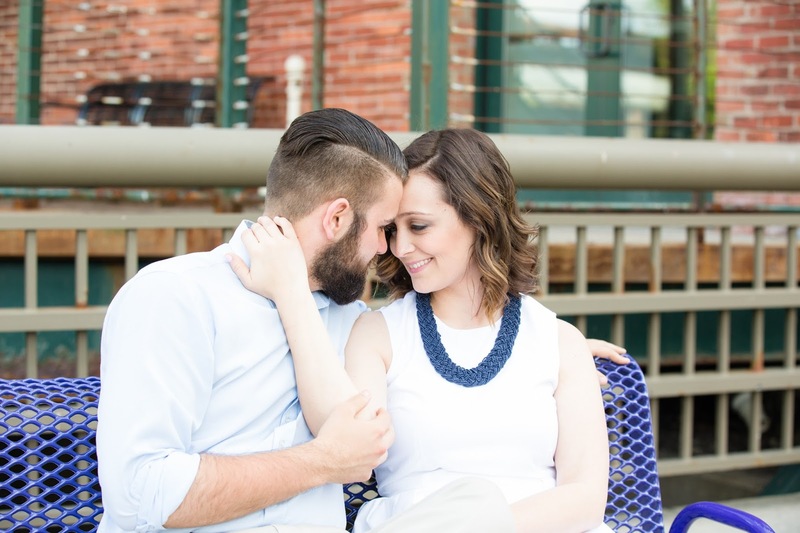 Linking up with Wedding Wednesday. 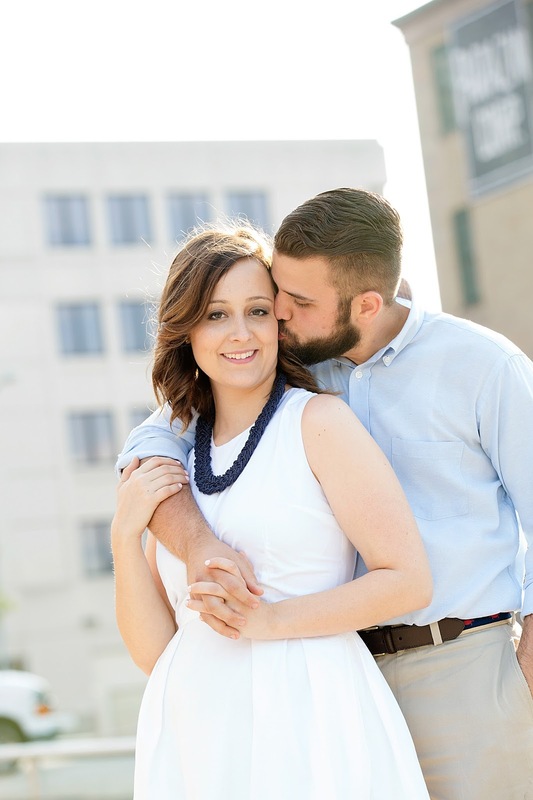 Your engagement photos are stunning! You guys both look great! These came out great! I dabble in photography and have done a few engagement sessions for friends and they are always my favorite sessions to photograph. I find it so easy to take photos of couples who are so in love! Oh my gosh, you are so beautiful friend! Not that I didn't know that already, but these turned out great! These are amazing tips, too. I admit I would be clueless about it! Love these tips!! I also love how many different scenes you had. We went to a huge park in our town, so we had a lot of different options for photos. I think that's what made it fun. I LOVE the dress you wore! These are such fantastic tips. It looks like y'all really enjoyed your engagement session and the pictures looks beautiful. I can't wait to see more! That necklace couldn't be cuter with that dress, and I love how y'all coordinated. Thank you!! It was totally weird at first. And really hot that day. But our photog did such a good job. Dave was so not into it at first, and then we got these back and he was like "wow! these turned out great!" Thanks! Our photographer was amazing! We were in one park, and then drove to another location. She was scoping out these places as we were walking along. The dress I wore is from the gap!